When is my rubbish collected? Recycling and food waste is collected weekly. General waste is collected fortnightly. 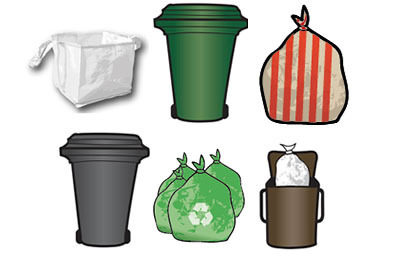 You will either have black wheeled bins or red stripy bags for your general waste depending on where you live. The amount of general waste you can put out is restricted in both bag and bin areas so it is important to try and recycle as much as possible. If you have a green bin, it is for garden waste. Recycling and waste must be put out on the pavement to be collected, and must be put out before 6:00am on the day of collection, or no earlier than 4:30pm the day before. Collections run throughout the day from 6am till 10pm. Please return your emptied bin (if you have one) and food caddy inside your property boundary by 9am the day after collection. Do I use bins or bags for general waste? To find out whether your property uses bins or bags for general waste collections enter your postcode on the council’s website. The results will show your next 4 collection dates and which containers / bags you need to use. When you know which containers you need to use for your waste and recycling, you can find out more about using bins or using bags and what support is available for larger houseshares for each of these containers. If your property uses red striped bags for general waste and you have just moved into a property and do not have any, you will need to supply proof of new residency (tenancy agreement/ property completion letter/ initial utility statement) before your supply of bags are issued. Please email your proof of new residency to wastemanagement@cardiff.gov.uk. You can also post a copy to Waste Management, Lamby Way Depot, Rumney, CF3 2HP or visit Monday-Friday between 8.30am-4pm. Please note we will be unable to return original documents, so please only send us copies. Green recycling bags are for your dry recyclables including plastics and tins, they are collected every week. Have a look at what you can recycle. If you have large pieces of cardboard that do not fit into your green bag, place them out for collection alongside your bags and they will be collected. Please empty and rinse out any food and drink containers before recycling them. You will have the same green recycling bags whether you are in a wheelie bin or bin bag area. If you live in a flat, you may have a large green four wheeled bin for your green bags. Green recycling bags are provided free of charge from the Cardiff Council. You can collect these from Council leisure buildings and libraries from Cardiff University Students’ Union reception and the Royal Welsh College of Music and Drama. You can also order them online. Every week the Council collects household food waste. Every house in Cardiff is provided with a kitchen caddy and kerbside caddy to dispose of food waste. Food caddies are for all your unwanted cooked or raw food, including fruit and vegetable peelings, left-overs, egg shells, tea bags and coffee grounds. Find out how to use your food waste caddies. Caddy liners and food waste caddies are provided free of charge from the City of Cardiff Council. Order them online or call the council helpline, C2C on 02920 872087. You can also pick up caddy liners at a Council leisure centre or library, or from Cardiff University Students’ Union reception and from the Royal College of Music and Drama. Just one caddy of food waste generates enough electricity to watch 90 minutes of Netflix on TV! Recycling 30 banana peels can create enough energy to power a hairdryer for 10 minutes, more than enough time to get you ready for university for the day. cannot wait for the scheduled collection date given for a bulky waste collection. For more information and a quote, please call 02920 717761. Don’t forget, if you are a Cardiff resident, you can recycle a range of items free of charge at the Council’s Household Waste and Recycling Centres. The Council are working with the British Heart Foundation to collect furniture, large electrical items, bags of clothes and media items for FREE, as long as they are in good condition. Book a collection online or call Cardiff’s dedicated number on 0808 250 0260. Find out more about what can be collected by visiting their website. If you item is not in a good condition to donate, the council offer a If your item can be recycled, they will collect it for free! It’s important that you dispose of bulky items and other waste and recyclable material legitimately, otherwise you could risk receiving a fine (not to mention the harm it can cause the environment!) For more information, have a look at this information leaflet from Fly Tipping Action Wales. Recycling or waste not collected this week? If you have placed your waste and recycling on the highway on the correct collection day and the Council have not collected it, you need to report this to Connect 2 Cardiff on 02920 872087 as soon as possible. This way, if you receive a fixed penalty notice when it’s not your fault, there will be a record of the missed collection on the system which can be used to appeal the fixed penalty. Before reporting a missed collection to the Council, please use this checklist to make sure you have put your waste and recycling out correctly. If you get a fine from the council for a recycling and waste offence you can pay online on the council website. Presenting waste incorrectly or using bins / bag for the wrong types of waste / recycling. Need a reminder? Download the app! The council have developed an app to help you to never miss a waste collection. You can even report in fly-tipping. Just search for “Cardiff Gov” in the Google Play Store or Apple App Store. You will receive an email the evening before your collection is due. 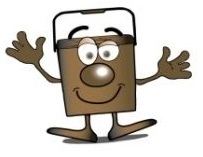 Your email will remind you what bins/bags/sacks you need to put out for collection. We will also let you know about any changes to your collection day due to Bank Holidays, and will email you recycling and waste updates throughout the year e.g. Christmas recycling advice. You can unsubscribe from the email reminder service at any time. To sign up, enter your house number and postcode and follow the prompt ‘Subscribe/ Unsubscribe to email reminders for this address’. You will receive a welcome email so that you know your sign up was successful. You don’t need to do anything else.